Mother, I am in love with a robot. No, she isn’t going to like that. Mother, I am in love. Oh yes, mother, yes I am. His hair is auburn, and his eyes are very large. Like amber. And his skin is silver. Yes, It stands for Silver Ionized Locomotive Verisimulated Electronic Robot. Thus opens Tanith Lee’s 1981 future inter-being romance, The Silver Metal Lover, a heart-wrenching exploration of romance, tech and yes, love. It tells the story of Jane, plain by the standards of her future oligarchic city-state (a combination of Privatopia and Somatopia) and firmly under the thumb of her powerful and rich mother. Seethingly comfortable with her existence, she meets Silver, an entertainment robot, playing guitar and singing in the plaza. She’s embarrassed. Then angry. Then hopelessly in love. Before long she’s thrown her old life to the winds. Short by the standards of most science fiction, with terrifyingly real characters, it packs a punch that’s not to be underestimated. When the The Silver Metal Lover is called a tearjerker, it’s the blunt truth. “Have you?” I said softly. I believed him. There was no doubt in me. I felt amazingly gentle. He raised his eyes and looked at me. His eyes seemed to go a long way back, like sideways seas, horizontal depths. The basic story Lee tells is an old one, and ever since science fiction began, there’s been mad scientists loving their beautiful steel creations. But, with her almost cringe-inducingly realistic characterization, Lee dumps the tragic ideals to show how such a taboo relationship might actually work. Suffice to say, I doubt this is the last time you’ll see her name on All Tomorrows. It should also be noted that she does occasionally don an appropriately festive seasonal hat. The Silver Metal Lover serves as far more than interesting exercise in “what if?” because it draws its resonance from the archetypal star-crossed lover tale it brings kicking and screaming into reality. Her quote above neatly sums up the strength of the book. Jane is human. We’ve all known — or been — her at some point. In little ways she carves out her own freedom, painting flesh silver to become something other and better than she’s known. Silver too, becomes far more than a machine, though never human, as Lee scratches at a common emotional core potent enough to be nameless (“humanity” doesn’t quite fit). The Silver Metal Lover is a herald of tomorrow. Minus a dark age, the day will come when machines react to humans to such an extent that the emotions could become indistinguishable. Forget the cold definitions of what really constitutes artificial intelligence. Lee’s right, the threshold will be crossed the day a robot returns an adolescent crush full-force — and it will probably be just as messy as she depicts. The Silver Metal Lover is also an old story: a tribute to the insane, stupid courage that comes from being in love when it could never, ever possibly work out. We’d have a bleaker world without. 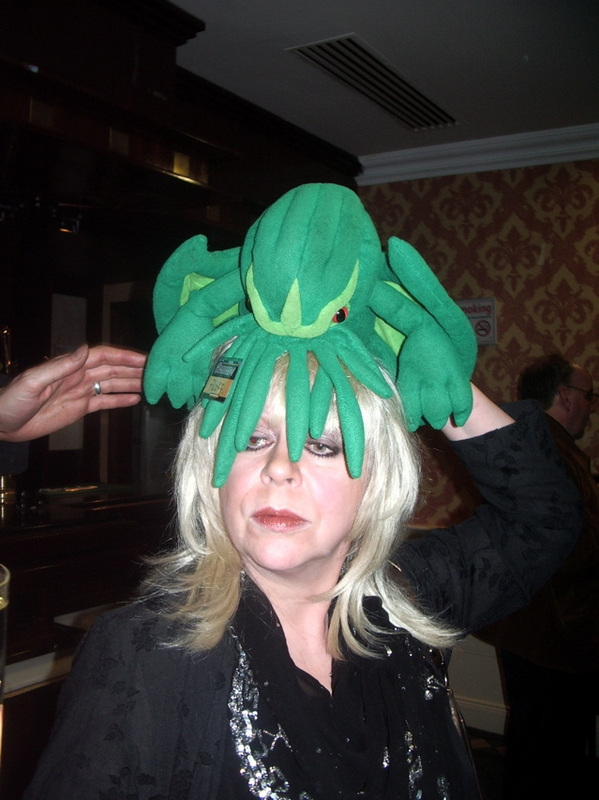 I had the good fortune to meet Tanith Lee when I was living in London a few years back. She’s a very gracious and funny woman, and she drinks wine in an impressively two-fisted manner. As to your question at the end of the post…one thing that I’ve noticed is that many people seem to favor “virtual” relationships over relating to the people in their immediate vicinity. This phenomenon comes in many flavors…from the person who text messages instead of talking to the people around them to the people who “date” folks they’ve never met in the flesh via the Internet. Lee wrote a sequel called ‘Metallic Love’ that came out a few yrs ago. Re: the Question, Facebook is a big one. To hook up or break up in the age of facebook, where the world can find out that you’ve been dumped before you do, is … new. Or a more potent, if less directly mean-spirited variation of something old (that is, telling everyone you know that you’re going to dump someone, and then making a show of it when you do). Also, I skimmed through Youtube to find a clip of Futurama’s “Don’t Date Robots” bit, but failed. You’ll have to imagine it. 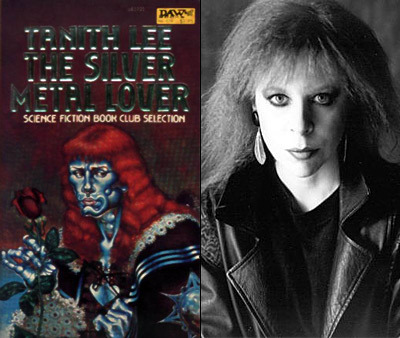 The Silver Metal Lover is one of my all-time favourite books: it’s wonderful to see it reviewed here, I also highly recommend Don’t Bite the Sun / Drinking Sapphire Wine aka Biting the Sun, which was written during the same phase of Tanith Lee’s career of early, brilliant sci-fi before she moved on to more pedestrial fantasy and horror. The Silver Metal Lover swept me away. Though I was 15 at the time, the effect was everlasting. How many times have I thought of Jane’s apartment and it’s tiled walls? I madly anticipated the release of Metallic Love. It was a fitting sequel that gave the adult Jane(and the readers) a sort of closure. Bitting the Sun is my absolute favorite Lee book. I highly recommend it to all fans of science, anthropology, love, hedonism, politics, and revolution. I’m sure some people find it strange to have a relationship with someone entirely by text before you meet someone. I’m sure some people 100 years ago thought it strange (perhaps even vulgar) to call someone on a telephone before you met them in person, as well. 50 years from now it’ll be common to not even need to physically be with someone to love them — I’m sure several hundred years from now it’ll be common for the object of one’s affections to not even be “naturally” biological. Shocking, I don’t know, sure it is to many, but in my opinion the greatest revolution at the moment is how a lot of people are challenging the idea, or dogma, that monogamy is the only way a stable and mature romantic relationships may be had. Chris L: 20th Century Fox had that clip removed from youtube but here it is on Hulu. Another book I need to read. To think I call myself a sci-fi fan. I’ve seen Lee’s works on the shelves at B&N and have not picked up one yet. Have to remedy that. As much time as I spend with technology (to the point I become nearly insane if my internet is down) you’d think I’d see some change. I have noticed with myself that I call people I know on the internet “friends” when speaking to people outside of the net. These people are just avatars to me when I’m talking to them either on LJ or IM. They’re people I talk to about everything and they are the greatest support network I’ve ever had. I think I almost lost my train of thought there. Hooray for this… My good friend Haley recently sent me a message saying that she loved too many boys and girls and that they were all trying to possess her. I wrote back that she should tell them that when she was feeling horny she put all their names in a hat and if they kept bothering her she was going to take their name out of the hat. Love no matter how short or fleeting is never a bad thing. I’ve long held that Real Dolls were more than the mere laugh factory fodder they’ve become. Glorified dildos, but much much more. Or at least, they whisper of the very things Lee writes about here. We’re already on this path. It’s just unfortunate that those pushing towards it are typically deemed nutters. Maybe more unfotunate (advantageous? ), is that a lot of them are. Heh. As to how I’ve noticed tech changing our romantic approaches: The net has allowed, for me, a level of honesty and openness, never witnessed before. Sure, a great many people lie, but those I’ve connected with and gone the step further, in meeting, have truly shown themselves Internauting as they really are. Breaking down the standard walls before they even go up. I think, again, in my own experiences, it’s shown people as just that: People. Makes it easier in our society, to see them as such, and not a romantic mark, just there to fulfill our needs. Love cannot be pinned down so easily as it has been this past century. Somewhere between chemical splash and fairy tale love, there’s a land where I appreciate friends and lovers, alike. And my relationships reflect that, or they don’t last. I used to think very badly of relationships that are primarily conducted by electronic means, but often these are the result of distance separating two people. Before AIM, Facebook, and Twitter, such relationships would’ve been pursued via extensive letter-writing. So what’s the difference, really, other than speed and convenience? Oh man. Tanith Lee. I too read The Silver Metal Lover and Biting the Sun when I was twelve or thirteen; they were instantly favorites of mine (and I still sob like a baby when reading the former). I’m excited as I will be taking a class in book illustration next semester, and I’ve chosen Biting the Sun as the book to illustrate for the entire class. I thought about doing Silver, but was afraid I’d make it a little too harlequin at this point in my progress. Sadly, these are the only two books of hers I’ve ever liked. I read the sequel to silver and it was far too cold and lifeless for me to accept it as anything close to the original. Her other work just seems way too flat and devoid of emotion, but maybe I just haven’t read the right stuff, considering how broad her career has been. As for the question, I rather miss the days where breaking up with someone was done strictly in person. The one serious relationship I ended I had the decency to end it face to face, while I have had to deal with numerous break up emails and AIM conversations. Probably the kindest I’ve ever gotten was a phone breakup. Classy. Can we do Kij Johnson next? I swear she’s like the female version of Neil Gaiman. @ Celine: Or Storm Constantine! Anne Rice may as well be fetid chopped liver next to her. I was hooked on Tanith Lee when as a teen I found a paperback of Dark Dance in the grocery store (of all places!) and begged my mom for it. I first read this book I believe in 1989? maybe 1988… bought @ a Kmart of all places. It instantly became one of my most prized titles in my library. The Greek Tragedy undertones are not to be missed.